Board-certified cosmetic surgeon and founder of North Shore Center for Facial & Plastic Surgery, Dr. Anthony J. Geroulis has announced that he will once again made a charitable contribution to the Center for Disability & Elder Law for the third year in a row. On behalf of his practice, North Shore Center for Facial Plastic & Cosmetic Surgery, Dr. Anthony J. Geroulis has made a charitable contribution to the Center for Disability & Elder Law’s annual winter awards benefit, Light Up the Loop, which took place on February 25, 2015. This year marks the third year in a row that Dr. Geroulis has contributed to this important cause. The Chicago-based non-profit organization provides legal services to low income members of the Chicagoland area who are permanently disabled or elderly. According to the Center for Disability & Elder Law (CDEL), studies demonstrate that over 80% of low income individuals cannot find legal representation. This growing problem, evident by national trends, is the driving force behind the work that CDEL does. With the help of corporate sponsors, individual charitable contributions and the staff of four attorneys and several hundred volunteer lawyers, CDEL has been able to help over 30,000 senior citizens and disabled individuals since their inception in 1974. This year’s winter awards benefit will honor a few of the those companies and individuals who have helped to make CDEL’s work possible, including their Corporate Partner of the Year, McDonald’s, and the Honorable Edward M. Burke (14th Ward Alderman, City of Chicago), who will receive the CDEL Impact Award. “I think it is very important to support local charities, especially ones like the Center for Disability & Elder Law who help so many struggling individuals. I am proud to be one of their supporters, and I urge the rest of the community to reach out and show their support, as well,” says Dr. Geroulis. 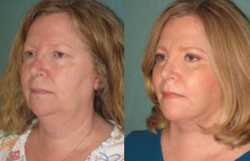 For more information about North Shore Center for Facial Plastic & Cosmetic Surgery, please call (866) 875-3937 or visit http://www.geroulis.com. Bringing over 33 years of surgical and artistic experience to the field of facial plastic surgery, Anthony J. Geroulis, MD, FICS, has repeatedly been named a “Top Doctor” by U.S. News & World Report. Board certified in cosmetic surgery, author and active sculptor, Dr. Anthony Geroulis is a clinical professor of surgery at University of Chicago Medicine specializing in eyelid surgery and facelift. His medical office is headquartered in Northfield, with offices in Chicago, at University of Chicago Medicine and at St. Alexius Medical Center in Hoffman Estates.